A family ski holiday is a great way to have fun with your loved ones while spending some quality time with them. But, everything has a price tag. Costs soon add up and before you know it, what seemed like a nice family adventure can suddenly cost you a fortune. The solution? Skiing needn’t break the bank if you know where to look! 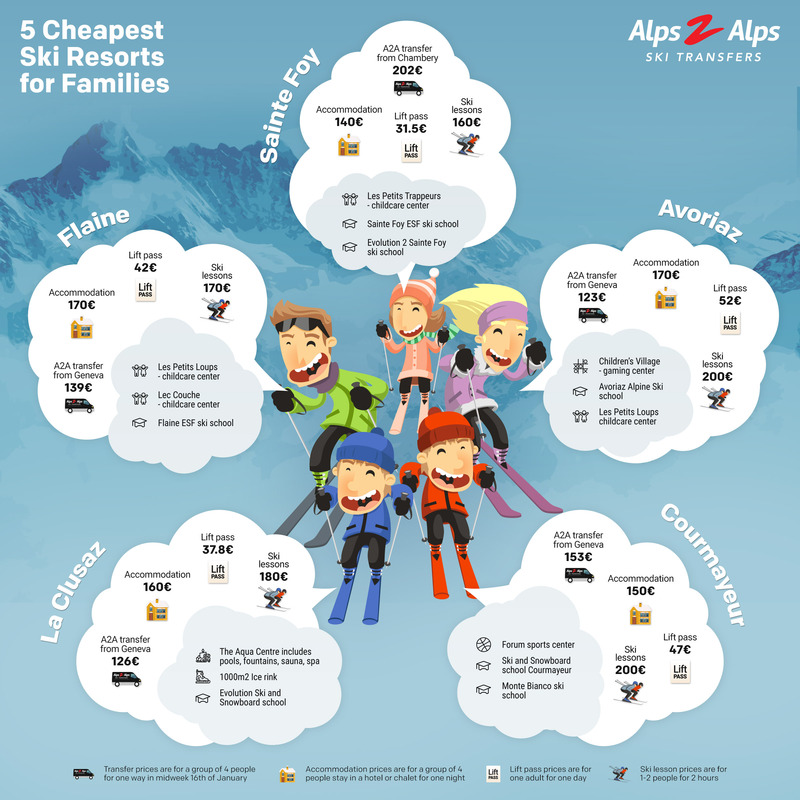 We’ve found the 5 cheapest ski resorts for families in the Alps. Flaine is the largest of the Grand Massif resorts. Situated near Geneva, this family-friendly resort has both a historic yet modern feel and is kind to those on a budget. Accommodation prices start at €170 per night for four people. You can stay in a cosy private chalet or in a hotel if you would prefer a catered experience. How Much Will a Lift Pass Cost? Lift passes at Flaine cost €42 per day for an adult. Passes for children cost €32.40 and seniors €41. Children under five ski for free. Flaine offers ski lessons for adults and children. ESF ski school offer fun and professional ski lessons. Prices start at €170 for two hours. The resort also has two childcare facilities. Les Petits Loups is for children from 6 months to 3 years old and Les Choucas is for children aged 3 to 11. The resort is well-connected, with a number of public transport options available. Alternatively, get a door to door transfer from Geneva airport to Flaine. Our cheap and reliable service will get you and your family to the mountains in no time. A mid-week transfer for four people one-way costs €139. Hoping to keep travel costs down even more? Remember – there are ways to save money on flights! This unspoilt, laid back French resort is an Alpine beauty. Whilst smaller than its neighbouring resorts, it is very charming and a great place to relax with the family. You can stay in a quaint bed and breakfast or a cosy chalet. Hotel prices for four people start at €140 per night. Adult day passes are €31.50 and seniors and under five’s go for free. They also have student passes for €25.90. The ESF and Evolution ski schools offer a variety of ski lessons at Sainte Foy. Adult classes start at €160 for two hours. They also offer group lessons if you want to spend more time with your family members. Not sure what to expect from your ski lessons? Tip number one: wear the right clothes! Private instructors are also available for off-piste and other courses. There is also a spa and fitness centre for some pampering time. For child care services, Les Petits Trappeurs Kid’s Club can look after children aged 3 to 11. Sainte Foy is an hour and half from Chambery airport. A mid-week, one- way transfer for four people will cost around €202 with us. You may also like: When is the Best Time to Book a Ski Holiday? Avoriaz in France is famous for its pristine mountains and beautiful scenery. It is one of the snowiest resorts in Europe, guaranteeing endless fun for you and your family. Hotel and chalet prices for 4 people for one night are around €170. There are many catered and self-catered options available depending on the needs of your family. Adult day passes in Avoriaz are €52. You can also get a family pass (2 adults, 2 children) as well as children and junior passes. Get better acquainted with the slopes with Avoriaz Alpine Ski School. A 2 hour lesson is €200 for 1-2 people. There is also an Avoriaz snowboard school and licensed independent instructors. There is also a children’s village for children as young as 3 and Les Petits Loups Childcare Centre is for children from 6 months to 5 years old. You can book a private transfer from Geneva Airport. Our price for a mid-week, one-way transfer for four people costs €123. This Italian resort has an authentic and traditional charm. Suited to shorter weekend ski breaks, Courmayeur is perfect for an inexpensive family ski trip. You can stay in Courmayeur for around €150 per night for four people. You can either stay in the town itself or in the pretty neighbouring hamlets of Dolonne and Entreves. You can get an adult day pass for €47. The Courmayeur pass also covers the areas of Chamonix and Argentière. Try Courmayeur’s Ski and Snowboard School or Monte Bianco School for lessons starting at €200. Every ability is welcome and there are a range of courses available. We recommend getting a transfer from Geneva airport to Courmayeur, which should take under two hours. A mid-week, one-way transfer for four people will cost around €150. La Clusaz is a small yet beautiful resort. This means its prices are as modest as its size. It is child friendly and a great place to relax with the family. You can expect to pay around €160 a night for four people. There are hotels, chalets and apartments available depending on the size of your family. A day lift pass costs €37.80. You can also receive an 8% discount on a family ski pass if you book it in advance. The Evolution Ski and Snowboard School offer lessons from €180. There is also a kid, junior and mice club for children of different ages and abilities. Located just an hour and half from Geneva airport, a private transfer is an easy transport option. A mid-week, one-way transfer for four will cost €126. Tempted to head to one of these resorts to enjoy some affordable, family-friendly fun? All you need to do now is get organised! Book your transfer from the airport in advance to secure the best deals and get your ski holiday off to the best possible start.